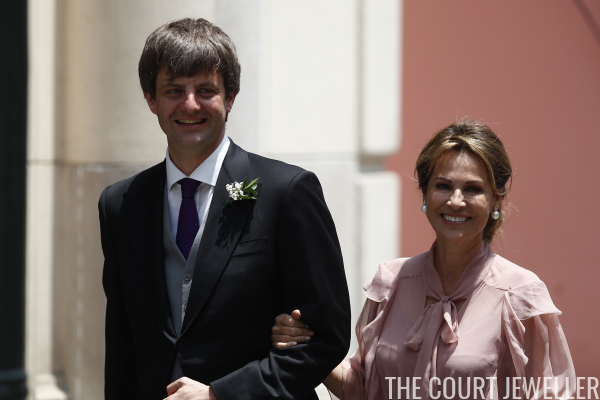 On Friday, Christian of Hanover, son of the pretender to the Hanoverian throne, married Alessandra de Osma in a religious ceremony at the San Pedro Basilica in Lima, Peru. 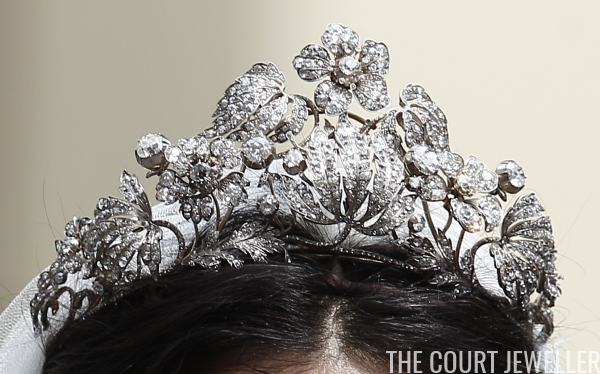 The wedding may have been far from Germany, but the family brought one of their heirloom tiaras along for the occasion. Here's a look at the jewels of this almost-royal wedding. Alessandra de Osma, a native of Peru, met Christian in 2005. The couple began dating in 2014, and they married in a civil ceremony in London in November 2017. Christian is the younger son of Ernst August of Hanover, who is the great-great-grandson of the last King of Hanover. Alessandra, who goes by the nickname "Sassa," is a fashion designer. 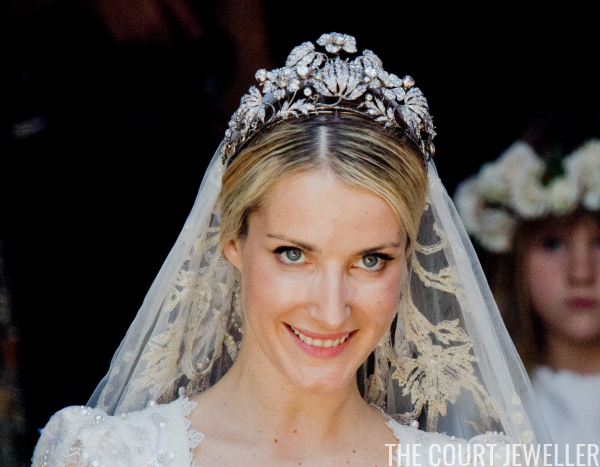 For her religious wedding ceremony, Alessandra wore a tiara from the Hanoverian vaults. This elaborate diamond tiara is made to resemble a floral spray, complete with blossoms, leaves, and berries. Not much is known about the tiara's provenance, but I think those who have guessed that it's a nineteenth-century creation are probably right. 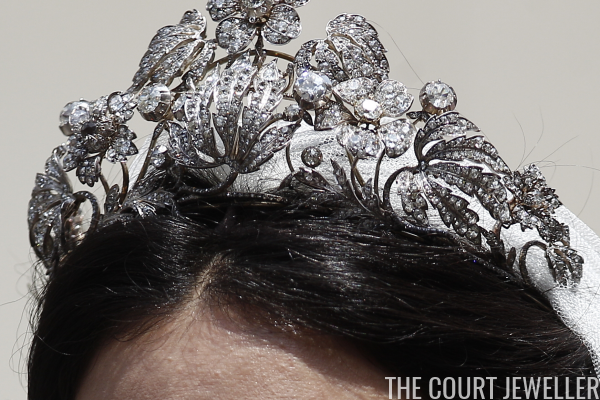 Here's another close-up of the tiara on Alessandra. This angle shows the elaborate leaf designs of the piece, interspersed with diamond flowers and berries. 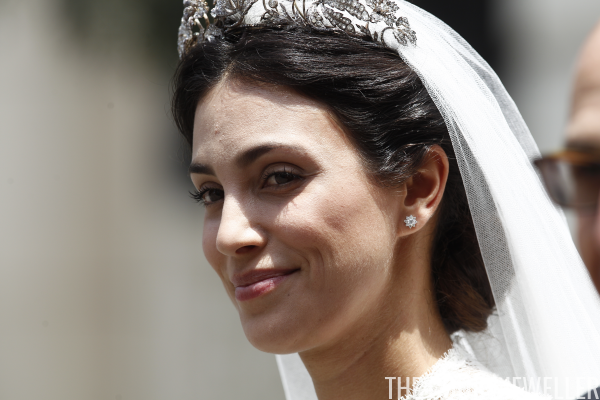 Over the last year, the tiara has become a favored bridal diadem for women marrying into the House of Hanover. In July 2017, Ekaterina Malysheva wore the tiara to marry Christian's elder brother, Ernst August. Read our post on that wedding over here. 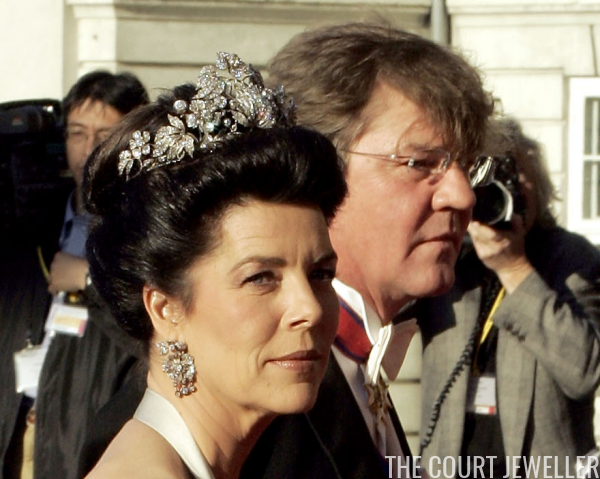 And in 2004, the tiara was worn in Denmark by Princess Caroline of Monaco during the pre-wedding gala for Crown Prince Frederik and Crown Princess Mary. Caroline has been married to Christian's father, Ernst August, since 1999, but the couple have been estranged for about a decade. (Caroline did not attend this wedding.) 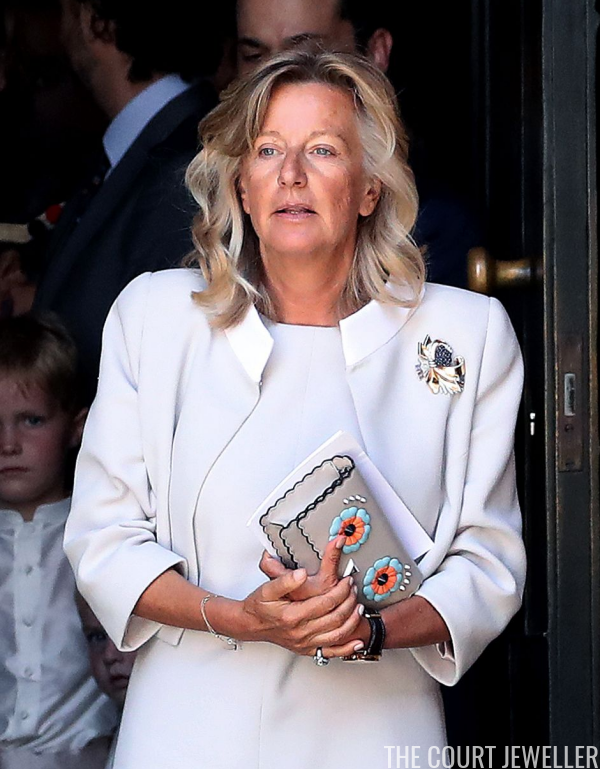 There are also photos of Christian's mother, Chantal Hochuli, wearing the tiara during her 16-year marriage to Ernst August. 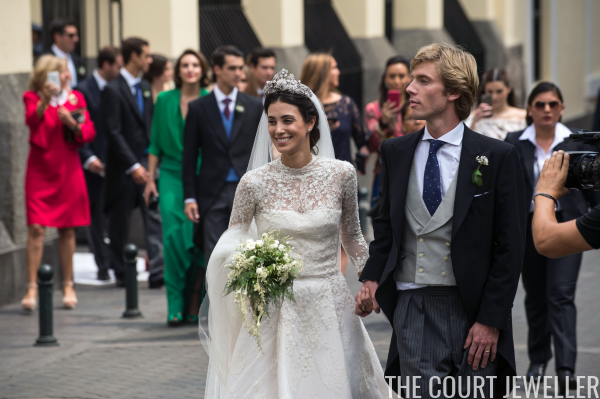 Caroline wore the tiara with floral earrings that appear to match the diadem, while Ekaterina chose to wear no earrings at all with the sparkler. 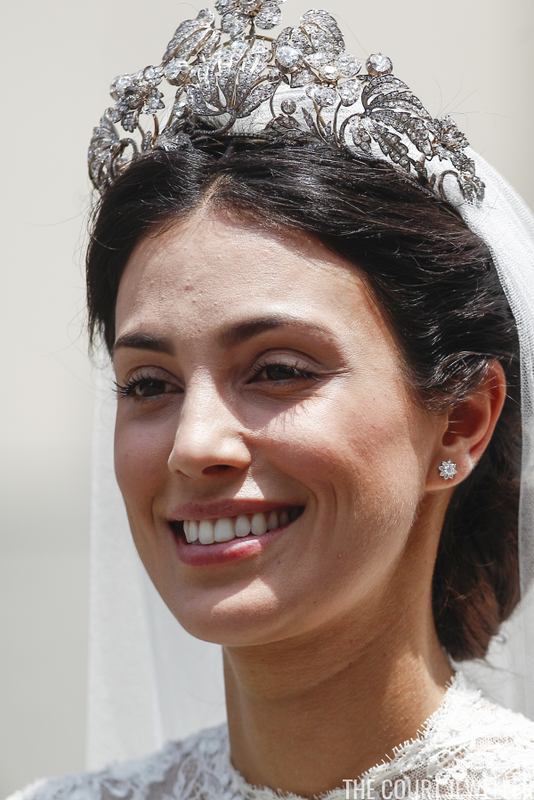 On her wedding day, Alessandra wore small diamond stud earrings with the tiara, adding a bit of extra sparkle to her ensemble that didn't compete with the immense wattage of the diadem. 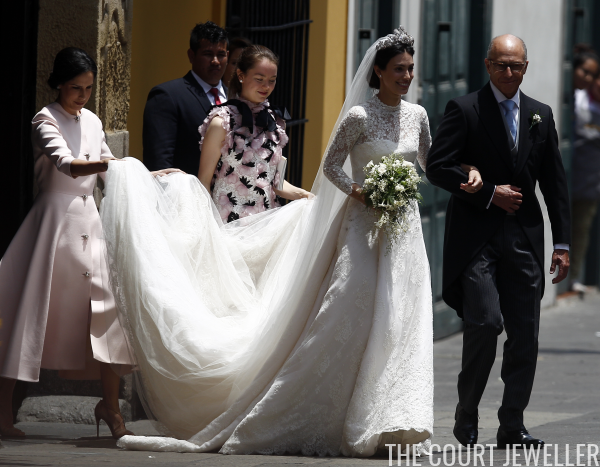 Here's a look at Alessandra's entire wedding ensemble, which was made of lace and featured a long train and veil. A Spanish designer, Jorge Vázquez, made the gown. She was accompanied by her father, Felipe, as she walked down the aisle of the basilica, and Christian's younger sister, Alexandra of Hanover, was one of her attendants. 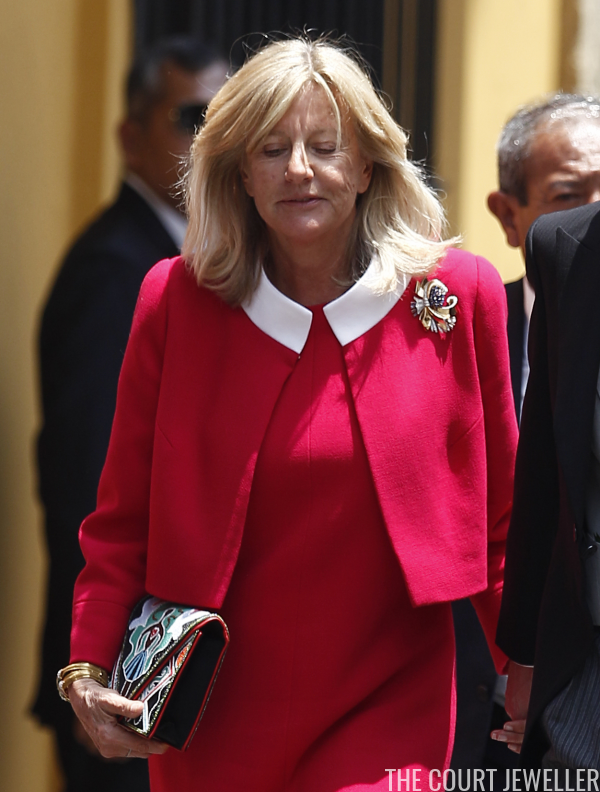 Christian's mother, Chantal, attended the wedding wearing a bright red dress and jacket, accessorizing with golden bangles and a large golden brooch. She wore a variation on the same outfit, including the same brooch, for Ernst August's wedding in July. 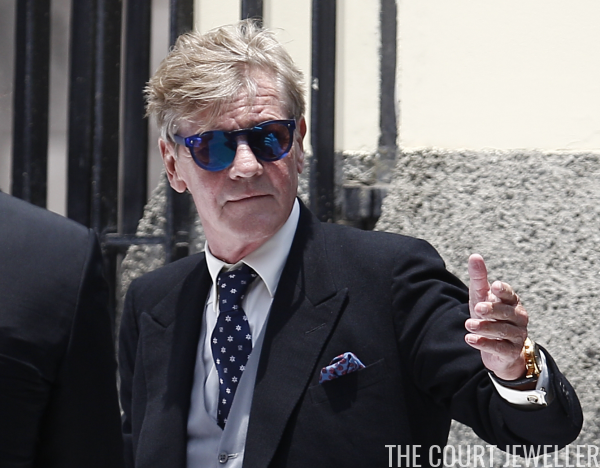 Ernst August escorted Alessandra's mother, Elizabeth, to the ceremony. She wore large pearl earrings with diamond accents. Ernst August's wife, Ekaterina, didn't make the trip to Peru, but she had a very good excuse: she gave birth to the couple's first child, a daughter named Elisabeth, in February. But there was one rather surprising member of the family who did make the trip to Peru: the elder Ernst August. He didn't attend his eldest son's wedding in July, following a very public family feud, but he was on the guest list for these nuptials. Alexandra, Christian's sister, is eighteen, and she's begun wearing large pieces of jewelry, including the diamond earrings she chose for her brother's wedding. 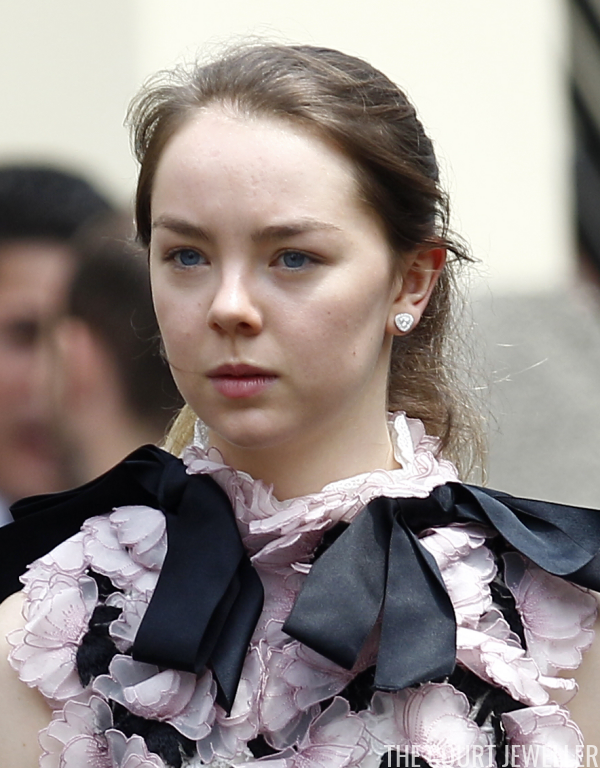 (The dress looks like one of the Chanel pieces favored by her mother, Princess Caroline.) For those keeping track of the relationships of the Hanoverian/Casiraghi kids, Alexandra attended the wedding with her boyfriend, German basketball player Ben-Sylvester Strautmann. Two more princesses were also among the guests: Princesses Beatrice and Eugenie of York, granddaughters of Queen Elizabeth II of the United Kingdom. As per usual, neither wore large pieces of jewelry, instead selecting delicate necklaces for the occasion. Princess Eugenie may have been especially attentive to the details of this wedding -- don't forget that she has a wedding of her own scheduled for this autumn. But look what the two of them wore for the reception! Both are wearing earrings -- including Beatrice! How about that?